Guillermo del Toro teased our classic scifi hearts by giving us an idea of who he'd like to cast as the Monster in his adaptation of Frankenstein (a project del Toro has had on the back burner for many months). "For the monster, I would love to have Doug Jones," del Toro told Shock Till You Drop. 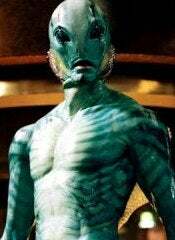 The famed creature actor is playing Abe Sapien in Hellboy II. An amusing joke or a pretty brilliant casting idea? Maybe a little of both. Click through to see who we'd cast as the monster. Del Toro went on to explain what he knows about Jones and why he connects this character to the actor. "I think he can do a fantastic job. Ron looks seven feet tall in Hellboy, but he's not. I think we could do that with Doug, but I would love to do it with him. The only vision of the Frankenstein monster I've ever latched onto is Bernie Wrightson's. He's lanky and long, and it's gorgeous in a tragic way. Doug has all of those qualities." Why He's A Monster: He's already played a classic monster, why not put the square head to good use and play a soft-sided monster with a soul, or something like that. Why He Won't Make It Past The Villagers: Boreanaz might have a little too much heart - he's got to be a little destructive after all. I can't imagine him breaking a little girl in two. Why He's A Monster: Bardem is amazingly scary with very little acting. He plays brooding so well and can make you jump out of your seat in a few seconds just with a look and a glance, perfect qualities for a monster. Why He Won't Make It Past The Villagers: The Spanish part of the monster might be hard to explain if Frankenstein is robbing English graveyards. Why He's A Monster: On the flip side, Irons is exactly what you'd get if you started mining English graves for spare body parts. His proper attitude could flow nicely with the educated monster, plus he's already got the commanding voice. Why He Won't Make It Past The Villagers: Too thin. Why He's A Monster: Monster work is Perlman's bread and butter. He's an old pro from playing Big Red to the Beast. Why He Won't Make It Past The Villagers: Way too obvious of a choice, might need to pass just because it's been done to death. Why He's A Monster: Let's put that brow to good work shall we? Just add a couple of bolts to the neck and voila, monster. Why He Won't Make It Past The Villagers: Might be hard to take Danson seriously. Audience members would be pressed to watch this film with out wondering who was tending bar at Cheers?